I decided that one of the reoccurring posts I would like to do is women in history and their influence on Freemasonry. 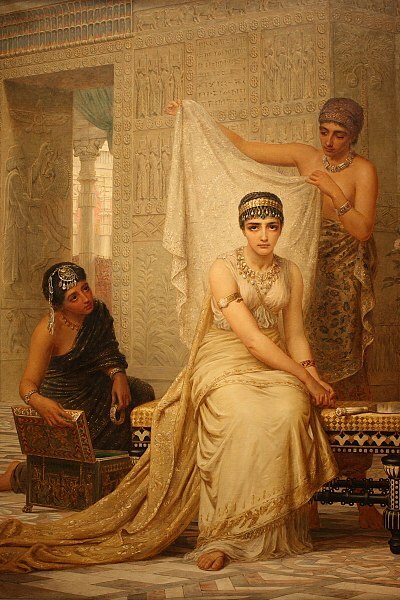 Since Purim (more on this in a bit) was on Sunday, I decided – why not start with Queen Esther? She has an entire book in the Torah/Bible, but a quick survey of my co-workers told me that no one had any idea who Queen Esther was, which leads me to believe that most people do not. So, let’s start with that. Way back in the day, sometime before 460 BC, King Xerxes I ruled in Persia (Xerxes the Great, known as King Ahasuerus to the Jews). He apparently had too much time on his hands, because he had been throwing a party for the last 180 days (yes, you read that right, 6 months of party time!) When he was done with his giant party, he decided to have a smaller, moderate, week-long party (you know, with just close friends). On the last day, he we drunk on wine, as I could imagine anyone would be. He told his wife, Queen Vashti, to dance for all the men at his party so that he could show off how hot she was to all his buddies. Vashti, who apparently had not been drinking near as much, refused. Xerxes had her executed because of this (some stories say divorced, but let’s be realistic here). After Xerxes sobered up, he realized he was “lonely”, and wanted a wife. It was suggested to him that he hold a beauty contest, and that he wed the winner. That’s exactly what went down. A young Jewess named Esther was one of the contestants. Esther’s parents had passed when she was young, and she had been raised by her Uncle Mordechai, who, at the time, was also the leader of the Jews. The story goes that Xerxes immediately liked Esther, and they wed at once. Mordechai told Esther to keep her nationality hidden, even from her new husband. There was a briefly mentioned incident where Uncle Mordechai learned of two men plotting to kill Xerxes. Mordechai altered the proper people, and the traitors were hanged. Shortly after this, one of King Xerxes ministers, Haman, was elected to Prime Minister. Haman was kind of jerk, and was well-known for not liking the Jews. One of his first decrees was that everyone in the streets must bow down to him. Our friend Mordechai refuses to bow down to Haman, and Haman takes it personally, holding a grudge against Mordechai. Knowing that Mordechai was a Jew, Haman decides to attempt to talk King Xerxes into letting him make a decree that all Jews should be killed. Xerxes, not knowing that his beloved Queen was a Jew, allowed Haman to do as he wished, and made a decree that the Jews would be exterminated on the 13th of Adar (Feburary-March). Mordechai, being the leader of the Jews, found out about this decree. He informed Queen Esther, hoping that she would be able to do something about it. Esther invited Xerxes and Haman to dinner, with intent of telling them both she was a Jew. She lost her nerve, and tried again. The second night, she begged them both to spare her and her people, stating that Haman sought to kill her (because she was a Jew). Xerxes and Haman were both upset, understandably. Since Haman plotted to kill the queen, regardless of the fact that he did not know, he was hanged.Kingly decrees could not be undone, so Esther and Mordechai wrote a second decree for the king (with permission of course), that the Jews could preemptively strike out against those they felt might want them dead. Halloween, Christmas, and New Years? Sign me up! One of the more interesting notes about this, is that women are encouraged to listen to the reading of the Book of Esther, because women were heavily involved in the miracle. In extreme Orthodox communities, this is a rarity. Sounds great and all, but what does this have to do with Freemasonry? Directly with masonry, not a ton. With appendant bodies, a lot. Esther is a star point in Eastern Star. She is the third star point. The story of Esther is taught, although in a shorter and more flowery version, during the initiation ceremony. A quote from Esther is her pass. Her star point symbolizes purity, joy, and light, although I do not think that these virtues have much to do with her story. What does though, is this, “In the excercise of authority we should be governed by justice and unselfish loyalty to the welfare of others. It was by the practice of these virtues that Esther was able to save her people from extermination.” I’m not sure that I can say it any better than that. You mentioned having, and possibly publishing, poems on each of the Star Points. I copied the one you printed with Adah’s story, but would like to see a poem for each of the other Star Points. I am being installed as “Adah” in my local chapter this October, and would love to copy them to use in the décor of the reception following the installation. Thanks for whatever info you can pass on.